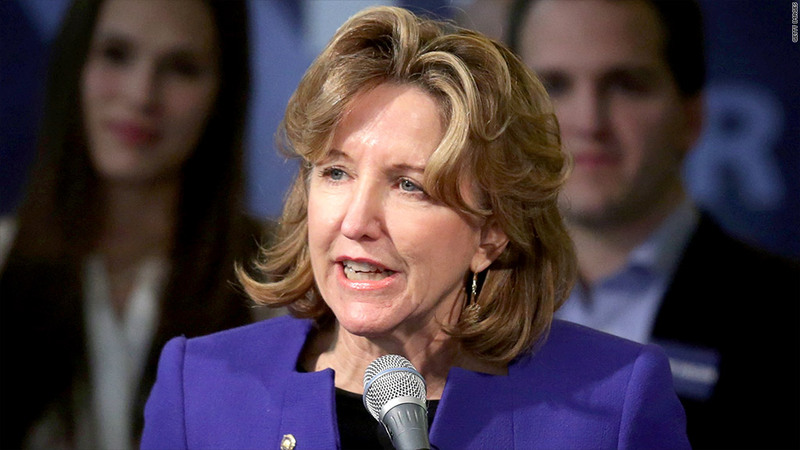 Kay Hagan will receive a pension after serving just one term in the Senate. More than a dozen members of Congress were defeated on Tuesday night. But taxpayers will still have to keep sending most of them checks. Members of Congress are eligible for a pension after just five years in office, so that means senators qualify for one after a single six-year term. But most can't start drawing full payments until age 62. North Carolina's Kay Hagan, for instance, lost her first bid for reelection. For senators and representatives with only six years in office, the annual pension is about 10% of annual pay -- in Hagan's case, that's $17,400 a year based on her annual salary of $174,000. She can start collecting her pension in May when she turns 62. Colorado's first term senator, Mark Udall, also lost Tuesday. But he'll be paid about $47,000 a year since he also served five terms in the House. Since he's 64, he can start collecting his pension as soon as he leaves office. Senior members with 32 years in office can earn 80% of their pay, or about $139,000 a year. This year there are nine members of Congress leaving with 80% pay. Many of them are already in their 80's, so they probably won't draw a pension for many years. But West Virginia's Nick Rahall, who was defeated Tuesday after serving 19 terms in the House, is only 65. Figures from the nonpartisan Congressional Research Service show that as of a year ago there were 617 former members of Congress collecting pensions worth an average of $60,250 a year, or about $5,000 a month. The total cost of those pensions comes to $37.2 million a year. The pensions that lawmakers get are defined benefit plans, which means they are guaranteed to be paid a certain sum for as long as they're alive. Another perk: These benefits increase with the cost of living. Both are features that have become rare in private sector retirement plans. While most former members of Congress have to wait until age 62 to start drawing their pension, those with 20 years of service can start receiving payments at 50. Members of Congress also have a retirement savings plan similar to a 401(k), which matches up to 5% of what they contribute to it. Georgia's Jack Kingston, age 59, is leaving the House after 11 terms following his defeat in the Senate primary. With 22 years in Congress, he'll be eligible for a pension of $62,640 starting next year. Spokespeople for Kingston and Rahall declined to comment about their bosses' pensions. Spokespeople for Hagan and Udall were not immediately available for comment.